Last week, the market wrapped up its worst Thanksgiving week since 1932, losing almost 5%, as I opined would happen the week before. There's been no material change in the counts since Friday. The bounce on Friday stayed within the crash channel, and as such did nothing to indicate a trend change, or even a slowing of the decline. However, as I talked about on Friday, indicators have all reached oversold levels, and sentiment has reached high bearish levels. Assuming my preferred count is correct, market surprises going forward should be to the downside. In third waves, momentum indicators reach oversold and stay there. Bounces that should materialize, often don't. That has already happened, as indicators have been quite oversold for some time now, and expected bounces have been non-existent to this point. But as I wrote this past Friday, now is the time when I'm finally starting to look for a bounce, because the charts are finally justifying it. Besides the chart potential, another argument in favor of a bullish move occurring is the fact that everything's gotten so bearish. Something has to give. The market is now like a rubber band that has been stretched to its limit: either it snaps back soon... or it breaks. But after Thursday's action, I tried to convey on Friday that a bounce definitely became something to be cautious of if you're holding short positions. If we do see a bounce here, I expect it will simply be a snap-back rally, though it could retrace as high as 1220. Regardless of whether we get a rally here or not, I am ultimately expecting lower prices over the medium and long term, and my preferred view is that the market will make new lows beneath 1074 before generating a more significant rally. As such, it is my preferred view that rallies going forward should be looked at as selling opportunities. The charts continue to reflect the stretched rubber-band scenario, and this has made the short term quite challenging to decipher. Sometimes, the short term potentials can be narrowed down to the same direction (or at least a higher probability of one over the other), but in this case, they're diametrically opposed -- one says dramatically lower, one says markedly higher. In cases like this, I always think it best to let the market dictate. The first chart examines what happens if the rubber band breaks. I have drawn two channel lines on this first chart. The black channel is the crash channel the market has been in for over a week, the red lines represent a larger linear regression channel. A break of the black line would be our first warning that a decent bounce may be in the cards, and a break of the red line would serve as further confirmation. The technical invalidation (or knockout level) for this count occurs with any trade print above 1198.50. I have also noted the position of RSI and MACD as something else to watch. Breaks below the recent lows on those indicators would indicate that the decline is accelerating again. 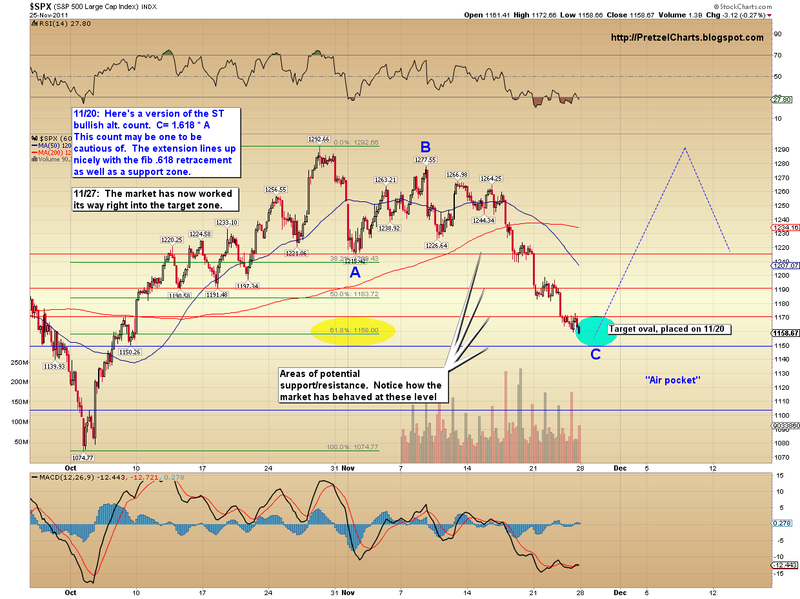 The second chart (below) shows how the bounce scenario could play out. This count is the same as shown on Friday, and views the recent decline as an extended fifth wave of blue 1 of red (iii). An extended fifth would suggest a rally all the way back up to the red wave (2) of blue v high, near 1220. I know everyone can do the math -- but that's 60 points up from here, which is another reason why caution is warranted for shorts. And finally, I haven't shown a chart of the bullish alternate count in a week, so it's time to update it. Interestingly, I haven't moved the blue target oval an inch since I originally created and posted this chart (pre-open) back on November 20. The market has now moved perfectly into the target oval. I continue to assign this count a low 15% probability, but this is certainly another reason for caution in short positions, since this count allows for 140 points, or more, upside -- and the market has entered the target zone, which means short positions become higher risk. One of the reasons I continue to give this count low odds is the US Dollar chart. The Dollar seems to indicate that there is more upside in store for Dollar bulls -- and it will be hard for equities to stage a meaningful rally in the face of a rising dollar. We should continue to watch this count carefully, however, and if a bounce materializes, I will update this chart as needed. Replying to your last post on the old thread, where you note: "2. A crashing Euro. Necessary for the above." I think that's the key right there. The Euro had a huge technical break at the end of the week -- I'm sure "they" knew they had to step in right here, right now to prevent an immediate collapse. PL: futures are at 1179 on S&P -- did you close out your short position you took on Friday? So key levels to watch: 1198 (for nested i-ii), 1220 (for wave 2 retracement for extended 5th), and above 1220 (bullish alternate count) correct? No, it could move above 1220 without necessarily being the bullish alt.. I'll have to watch the structure and update that count as it goes. I haven't closed yet, but have stops not too far above the gap high. I also took some positions b4 the close but I need to wait until the open -- what level would you think would make sense to close them out? I just edited that post pretty significantly to try and make the reasoning more readable and understandable. Glad you agree, though as I stated in that post: This is ULTIMATELY about preserving the entire financial and structural edifice of the welfare state, including the financial institutions and structures that are necessary for it's continuation and survival. Which necessarily requires the ability to issue debt and the existence institutions and entities that will purchase and hold those debt instruments. Without THAT, the game is up. Big time. No more buying entire constituencies with welfare programs. And since a crashing Euro is incompatible with that (and a devalued dollar IS compatible with that as well), the Euro needs to be rescued. Otherwise all those bonds don't get purchased, yields will continue to skyrocket, Euro bank balance sheets become untenable and insolvency (both for entire governments and their private banks) will reign. This about surivival and preservation of an entire system and way of doing things. That isn't going to just be given up without first doing everything that can be done to 'save' it. My key takeaway from this: 'they' are not going down without firing every last bullet. And it won't be until every last bullet has been chambered and fired that we get to the true waterfall. When the understanding then becomes: you've got nothing left. That's when a true waterfall panic that would lead to the eventual lows you've been talking about happens. And it still awaits us. This plan, like all the others, will fail too. It's just a matter of time. Hi PL: -- I posted this below but maybe you didn't see it ......I also took some positions b4 the close but I need to wait until the open -- what level would you think would make sense to close them out? "they" sure knew how to read charts and count waves too :-P The magical hand of intervention has a lot smart technicians working in the lab.. . It's a bit more complicated than that, I guess. I'm watching the Euro and dollar very carefully, and my decisions are tied to those to a degree. So far, Euro looks like an abc correction up, which could be nearly completed, but dollar looks like it could test the 79 +/- level. I raised my stops a bit for the time being, and may look to cover on weakness, depending on the structure. Hmmmm, I'm a total Fibonacci neophyte, but I just ran the quick calculation: The rise from 1,074 to 1,292 is 218 points. An 61.8% retracement is 134.7 points. 1,292 - 135 = 1,1557. We closed Friday at 1,258. Thanks -- not looking for advice -- just information! 61.8% retrace is *exactly* 1158. Ha, ha. That was more newbie pride for knowing to at least check . . . and then finding the answer. Wasn't thinking you'd not catch that yourself. I would assume that the bots and algos have this programmed in. Maybe this was 'planned' all along? Hmmmm. The symmetry actually bothers me a little. the fact that A and C now have a perfect Fib relationship, and the fact that this relationship perfectly targeted the .618 retracement. We'll have to watch that count carefully, much as it disagrees with my dollar analysis. In fact, my dollar analysis is largely what's keeping me from giving it more credence than I have. I expected a pause here for the dollar, which we're getting -- but if it starts breaking key levels, I'll have to reasses. I found your site a few weeks ago (redirected from Red Dragon, I think) and have enjoyed reading your posts, as well everyone else's. I love my Elliot Wave stuff, so I am having just the smallest trouble understanding your second chart above. You show a target of 1140-1150, with a blue wave v and 1, which then leads into a bounce for wave blue 2. While I think this is quite probable, I don't understand why you don't label the bottom as a wave (iii) in red? This should then lead to a wave (iv) retracement (to about 1220). Can you illustrate with a chart? Hi Jed, thanks, and welcome! I just think it fits the entire structure better. Seems a little short for all of (iii), but it's certainly possible. Hm.. now I just remembered one thing from my candlestick book - take profit (short) after 7 down days ... never so true... ancient wisdom from Japan! Looks like a bear trap to me, IMO. We shall see. PL, great charting, writing and explaining as usual. But, your bounce scenario and bullish alternative look rather identical, with around the same lows, except for the difference in highs (~1220 vs ~1290). can you maybe explain what the (internal) structural difference is? I'm going to do an entire dollar update right now, since its critical to so much here -- so I'll come back to these questions. sorry meant to say "bull trap", nevertheless I bet it flushed out the nervous bears too. Are we already on a Chistmas rally? Well, not much conviction for a rally at the moment down here on the JSE. Our market now only up less than 0.4%, less than half the gains of earlier on. I see Europe opened pretty strongly and still very excited by it all. Will be interesting to see if there is any follow through conviction on this initial euphoria. So far, dollar is holding the first test zone, just below 79. Ideally, I'd like to see the dollar start a recovery from near this level. 78.605 becomes the next important level, if the dollar can't hold here. objective and not be swayed by news stories or other noise. light...Is this fun, or what? Just posted a quick dollar update. Paolo, 1285 and 1099? You lost me as to why you're using numbers that aren't highs or lows? The SPX high was 1292, the low was 1074. The .618 retrace was exactly 1158. Covered my Friday shorts, btw, at 1175 for -15 (woo hoo! ), because the decline looked corrective. Of course, those shorts netted 80+ points on the recent move, so I'm dealing with it alright at the moment. And *that's* why you stick with your original plan -- especially when you've been AFK all day, and are subject to make rash or undisciplined trading decisions, due to Black Friday holiday sales and ridiculously long lines causing your brain to melt. Looking to dip my toe in again around 1190, assuming we get there. But that might be a short term trade, depending on what develops after. In a perfect world, the extended fifth retrace should hit 1190ish, drop, then come back up toward 1220 -- roughly as shown on the chart. Spx futures up to 1186 already. At this rate, 1220 spx should be achieved by end of this week, max. ANON20 Silver opinion update: up approx. a buck this morning (to low $32 area), but still considerably under old trading range (high$33's to low$35's). I will add puts when it reaches low$33's area this week, since once the spx commences it's dive into w(3), the prior small resistance of $30.70 (that held last week) should be taken out easily, and silver then should straightshot dive into the $25/$27 range, for a larger % gain once again, than the spx. Not trading advice, just MY permabear opinion. Since silver pricing decompresses faster, historically, leading way down once easy liquidity rapidly shrinks, and only in matter of days, providing precipice drops. Note the enclosed kitcosilver.com 1-year chart, and how silver totally crashed twice already this year, in late April, and once again, in late September. Therefore, I expect a third similar sudden precipice drop (though smaller), from low$33's to low$26's (approx. 21% drop), ocurring in only a few days, IMO, to align with spx w(3); and probably lead all pricings down (as it already did 2 weeks ago) and maybe even hitting $23's, who knows, if the forthcoming down leg, is truly is a w(3), taking spx to around 1000. Italy was fun, but the long plane ride was not. Wait... what's been denied already? This looks like a sucker's rally if there ever was one. Black Friday sales? Could there be a more IRRELEVANT economic indicator? And the IMF bail outs of Europe? Yeah, right. I suspect this is more about the market simply being oversold and stretched to the downside. With the news just to make the masses pile on. This looks like a gift to bears by the time it's all over though. Retails shorts will have been cleared out . . . and then the news can go back to being negative again. The wife has the pics, I'll see what I can do. I did like the food on Air Italia, wine included free. Looks like my email account got hacked, probably from using an unsecured pc on the road. Account is locked and I'm working on getting my access back. The Economist mag is full of doom and gloom over the Euro. They talk about it as a long shot to not break apart. Beating up the German chancellor because she is not bailing out the spend-thrift nations. Interesting article on Japan. The gist of it was, even though GDP growth has been slow, the large elderly population is living pretty well. Something of note: Last Monday, we gapped down from around 1,216 to 1,194. One would expect that to get filled (at the very least) before this sucker's rally is over. We sit at the threshold of filling it now at 1,193. May be a good place to go long for an ST trade. Dipped a toe in short at 1192 ES. Bears want to see Euro move back below 1.33 again. This is one of those moves across the that could have some momentum, though. 1.35 still important. SPX 50 dma @ 1200. PL, it is safe to say scenario 2 is in the making. Is your shaded "2-box" time-realistic or were you working with the space available so to say? I thought IMF already clarified that they had no plan to bail out Italy. Market rallied anyways. Apparently markets rallied from being oversold in the first place, not because of the news. Extended fifth waves usually have a rapid retracement, so the box is reasonable, time wise. There is an old (succinct) saying in Spanish: "Lo barato, sale caro." ("What comes cheap, turns out dear"). Myself, I have often found this saying to be correct. However, I also have MY OWN saying, which goes: "That which you do for yourself, is better remembered, than if done by another for you." Hence, IMO, it always comes down to a personal choice (not money), as to what matters most to you. And apropos today's violent manic beartrap rally, I again send you (since you did not comment on it previously) the 1930-1932 excellent simple chart (provided free of charge by your close "friend" Bob Prechter), that clearly elucidates the VIOLENCE of GSC bearmarket rallies; and that, most importantly, despite an overall EIGHTYSIX % market fall (in ONLY 27 months), there were MANY bears totally CRUSHED by the severity of these 7 sudden, manic, beartrap rallies. PL, thanks for explaining! I'll remember that extended 5th waves are followed by rapid retracements for ever, as I slap myself in the head for not closing friday (since my sleepy brain thought 1PM PT... instead of 1PM ET). But I am more a IT trader so I am waiting it out; I learned that panic selling never gives results. Btw, I am 6'4" too, so I hear your "flight-pain". But, I fly ~75K miles a yr.... though getting upgrades 2 out a 3 times. lol -- I must have mentioned somewhere along the line, that I have a home studio. Unless you tracked it down on the internet somehow, though that's incredibly unlikely. I have a few songs posted here and there, but you have to know where to look (can't find 'em through Google, I've tried). I actually haven't written much recently. My co-writer (and best friend) died suddenly, about a year ago, and I haven't really had the muse of late. Yes, excellent chart. Somehow I missed it last time you posted it. Dollar trying to build a base, from right inside the target range posted in the dollar article. William noted on that thread that the Your Ho looks like an ST double-top. Barney Frank won't run in 2012 - now I am worried about the rally as we saw with Europe - when terrible leaders step down stocks rally. When you count all the morons that occupy the house and senate, we could see dow 100,000 !!! Yeah, finally figured that out. I rely on you guys to deliver the news to me. I heard about the bailout here, and I heard about the bailout being BS here. Otherwise, I'd have just assumed it was the extended fifth completing on schedule! Years ago, I used to keep CNBC on while I watched the markets -- but I found it generally made me trade worse, not better. Then it got to where I hardly watched it even when the markets were closed. At this point, I haven't watched it at all in about 3 years now. PL, if/when the DX breaks out past 80, do you have any initial targets in mind? Looks like it's basing here between 78.8-79 right now. I do agree as far as piling in RIGHT NOW. I was thinking out loud more about the time frame over the next couple days. I would expect the market to work off then initial round of selling and short covering, while for chopping sideways for most of the rest of the day. Once that's over, I would think the action is higher (ST only), not lower. So Barney Frank should be good for a bounce up to around 1,300 then, right? I would think one of the primary architects of the no-doc-lend-to call comers banking policy and ensuing real estate bubble . . . is a way bigger fish to fry than just another European dignatory being shown the exit door. Yes, I saw it, but you do not REALLY want to know, what I think about it. Well, keep in mind that I mentioned in the article that I haven't charted it yet at Primary and Cycle degree, and that could really change the outlook. Solid, it looks like EUR ran into res at 1.34, hopefully this contains the SPX rally and puts a floor under DX so it can get to those levels. Dollar putting in a nice bounce off the base mentioned by me earlier, and rob just now. Equities oblivious to this, apparently. Dollar looks strong against the yen right now, too, btw. I have intraday low on Trin @ .09? As Lee likes to say, "Shorts are their own worst enema." Thanks for the dollar update, Pretz. My novice 'read' on equities is that pros are content to drain off all short coverers and sellers at this level. Whenever I see the BB's pressed this infuriatingly close together for over an hour along with meandering one the three minute indicators, then a meaningful move is within an hour away. With the 30 and 60 minute Stochastics, Williams and RSI all peaking, I would more expect a fakeout move lower to get retail longs to trigger their stops and to get shorts to pile back in . . . then we go higher again. I'm don't have any positions right now. Not enough info for me to trade the current flatline. Oooh, wall paint... I'm thinking about calling it a "night" here soon. I haven't had this much fun since the last time I took my cat to the vet. Your proposed scenario actually lines up quite nicely with the expected path an extended fifth retrace would take (as shown on the chart). You'll notice the first peak was right about here, then drop and rally up toward 1220. That's the "usual" response in a fifth wave retracement rally. Past performance is of course no guarantee of future results and all that. I disagree with you on grand super cycle degree, as I am certain 300-yr. wave 5 ended in late 2007. And that goes for all markets, except for cash. And that is my only exception with your ew analysis. Which is always first rate, IMO, if not I would not continue coming here, every damn fkkng day, to read what you ew interpret. You stated it herein, several weeks ago, that you were a closet rocker, so don't flatter yourself. For only if you were Mira Sorvino or Scarlett Johansson, would I internet track down every minuteau (and unhealthiest, most unclad pics) about you; yet, you are not remotely them. I solely find your (junior) Jekyll and Hyde complex (shared with BP), interesting. For all human psyches need to 'irrationally' scream at filthy night, in a jungian psychic balance way, to what they have chosenly constricted themselves daily to do---in 'rationally' proscribing themselves, by light of day, to an ubertight, fixated, disciplined, rigidly-codified way. Cool. That's good to know. I'm working with much less evolved models and assumptions over here, you know . . . But we haven't broken 1198.50, so we are still possibly in the slightly preferred uber-bearish scenario, right? Either way, I started adding back shorts around 1195. Will add more if we continue to rally to 1220. Interesting note: SPX came within 1.15 of KOing the nested 1-2, but didn't. Dollar has put in a good looking W-bottom exactly where it "should" have for a fourth wave in the count shown in the dollar article. 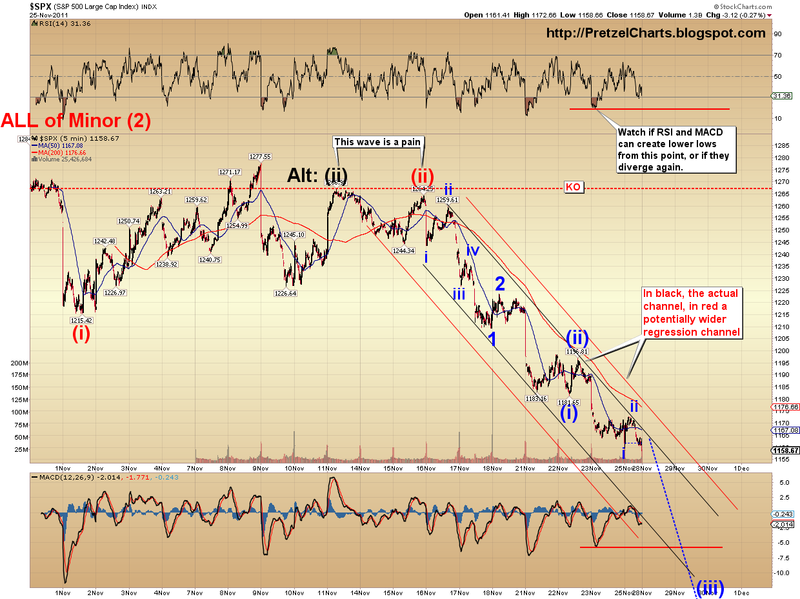 Further, the decline into that bottom looks corrective. Euro now flirting with 1.33 again. If it can't bounce here, it's uh-oh time. NO, because he is a LIAR, and he can no longer HIDE it. 6 point change in the last 2.5hrs.... zzzzzzzzz.... oh no, look, a rally of the 1190 low... is this all the bulls got: market manipulation??? so, there goes 1198.5, so do we get a drop to 1173 tomorrow and then up to 1215 by end of week? pretzel, any counts that wont have us moving above today's high to complete the counter trend rally? Just curious if I should be looking for a chance to cover or if we could dump straight from here. Yes. The nested 1-2 count. Here's a fun fact: 498 of the 500 SPX stocks are green right now. Assuming this holds, it's only happened one other time since 1997 -- on Aug 11, 2011. SPX dropped about 50 points the next day. There really aren't any guarantees in a wacko market like this. There are a lot of different options on how the very short term could play out. For example, the extended fifth wave could make a last quick thrust to 1200, then fall back to 1170ish, then rally up to 1220. Or we could just drop like a rock overnight. Sorry I don't have more info for ya at the moment. On that note, I need to try to get a few hours sleep before I drop over. You guys can help yourselves to the complimentary snacks, but don't let Frank drink all the sodas again. He gets WAY too wound up when he gets some caffeine in him. PL, regarding your fun fact; did you mean aug 9-10 instead of aug 10-11, 2011? since S&P went up the 9th, dropped 50 the 10th, and gained 50 again the 11th. I don't want to be nitty-picky, but just making sure we're talking about the same. Just trying to get my head around the second chart on this page, which I am assuming is your preferred count now: Is this mini rally the santa claus rally you were expecting? The same bounce you were expecting from 1000-1050?If all goes according to this plan, are we going to be in 3 of minor 3 after the 1220 target is met that will take us all the way down to 800s? Just trying to get an idea of where we are in the bigger wave structure on this attached chart. Thanks PL! I can see by the trusty feed on the side panel that the EURO just lost 1.33. I likey. Here comes the 3:55 EST ramp job. Now that pretz is sleeping and the rest of you guys have nothing to do: check this out, Moses theory? Four 5wave estensions? Are those "doubling in depth" corrections relevant in a log chart? Is the moon roqufort or stilton? Who is Alf Field? And... I do agree with his list of Brutal Truths. Day traded TZA in the range today and closed the position before the run up at the close... whew!. Not getting that warm fuzzy feeling that 1170's is on tap tommorrow without some consolidation and a bit of a reality check on the part of the markets. It seems that unfunded promises hold water with the media and the market currently. Tomorrow the headline will be that unfunded promises don't hold water with the media and the market probably. If they actually figure ou the truth tomorrow, I'll jump back in. 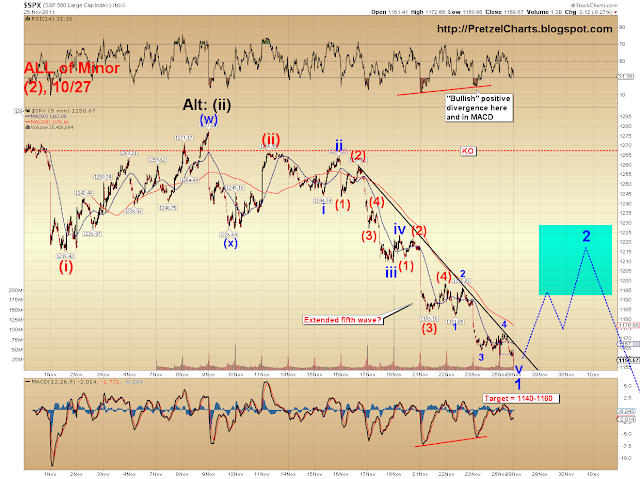 This is an update of his EW gold chart to Near Now. The arithmetical approach is interesting. Maybe just to encourage those who reject EW? Pretz do you think his projection of gold at 4000 could happen? This is the Best blog! Well, today's trading did not surprise. Buyers have spent virtually NO AMMUNITION for this current bounce so far, other than that mini-rally back up in the last half an hour, which cost bulls virtually nothing. We did get something of a mini-bounce down, as should also have been expected. And now anyone who shorted there is now trapped ST. So now whatever stops on long positions that were set just below 1,190 got cleared out in the last two hours of trading. I'm definitely bearish over the IT and LT. But unless there is simply zero confidence among bulls and buyers heading into the next couple days, I very much believe we are going to see an ST higher move from here. Simply put: Bears just got utterly dislodged from their positions, and the Street's pro shorters will be more than happy to wait for higher prices to go back in. Meanwhile Bulls still have ALL of their bullets available. So advantage buyers by a long shot. Add to that: Today's narrow range and meandering movement would lead gullible bears to conclude that bulls just don't have much fight or confidence in them. I could not disagree more with that notion. And the effortless move back up above 1,290 at the close today should serve as fair warning. The next question comes to mind for me now is: At what level do buyers have no confidence to continue further upward? The answer to that is the stopping point to where they'll take the indexes to accomplish distribution of overpriced inventory. And also reposition to go short again. Less than two weeks ago, that level was 1,265. Buyers would not tread past there, even though they could have run it up to 1,280, with no real resistance from sellers. 1,265 was the level that allowed the Street's pros to convince hopeful longs to stay in; sell to the gullible; position for the impending move back down; keep bears scared of the upside possibility; and keep buyers above 1,265 trapped. If one believes the GSC 'end' is here and that spx 1292 was a BIG top, then the rally is likely to last longer than most expect. As per Anon20's 1932 chart, the shortest bear market rally was 14 days, and that was at the very end of the bear. The others of the 'shorter' variety were 4-5 weeks in length - which would take us to year-end quite conveniently. They obviously weren't straight up, but they didn't turn around completely after 3-4 days either. The longer ones were 10-11 weeks in duration. Things could move faster nowadays than 1932, but i doubt the change would be of such an order of magnitude to change the unit of measure from weeks to days, IMO. Vulture. Sideways trading after large gap moves and then a minor retrace into the gap to clear out what lies beneath are extremely common. More the norm than not. I think you give way too much credit to the rationality of hopeful longs. The way I think they'll see it: this is our chance to buy time and put off any inevitable waterfall until after the first of the year. We just carved out a low for the current cycle and so there is upside room. The news and season are back with us at the moment. And sellers are currently discombobulated. I don't think it'll last very long, but the above can easily have legs into next week. Not quite sure how anyone is taking 1 single up day after 7 down days and turning that into a rally ? This is the same action in reverse the market did on the way up - ratchet up, have a pause day or maybe a single down day to shake the trees then continue. This was low volume junk at some arbitrary stopping point after we broke through anything that could be called support. Again, on this board, when people start worrying and talking about rallies, it's usually prime time to short. The VIX went no-where, there isn't any fear, no real bearish sentiment, no, um, anything to launch a rally from. vulture, I agree. Checking the daily-TRIX and you can see it is still in sell mode. I like TRIX as it filters out "market noise" much better than many other oscillators such as MACD, SSTO etc. It seems to me that we have some ways to go (down). It is still in sell mode (under signal-line), and it approaches 0 (from above), not bottoming out at all/crossing over from below (that be a buy signal). Based on the wave structure, I don't expect this rally to last long. It should be a fast and furious counter-trend rally that leads quickly to new lows. Might bounce back and forth a little, but it shouldn't be on par w/ the rallies in A20's chart. The "Santa Rally :o" on that one chart was a joke. I'm not expecting a Santa rally -- I'm expecting a Santa Dead-cat bounce from much lower levels. What time windows do you use when referring to short term, medium term, and long term time frames? Michael, I generally use them as "relative" terms in relation to the context. Speaking very generally, ST would be a couple days to a couple weeks; MT would be a few weeks to a few months; LT would be 6 months or longer. 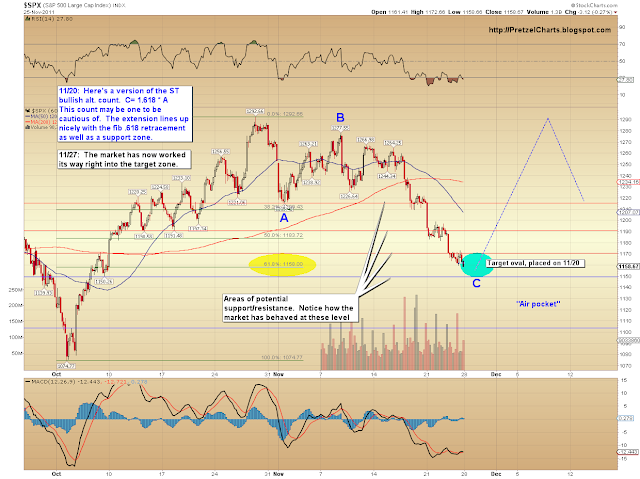 Still thinking a drop to 1171 and then a bounce to the 1220 area and down from there? I understand MR's comments below as its huge from a trading perspective....as I know you are well aware....from a purely hypothetical perspective, of course! On a different note, but same song, has you mindset changed on the US dollar? Hope you enjoyed your T-day! No change in either -- I don't think this SPX rally will last long. 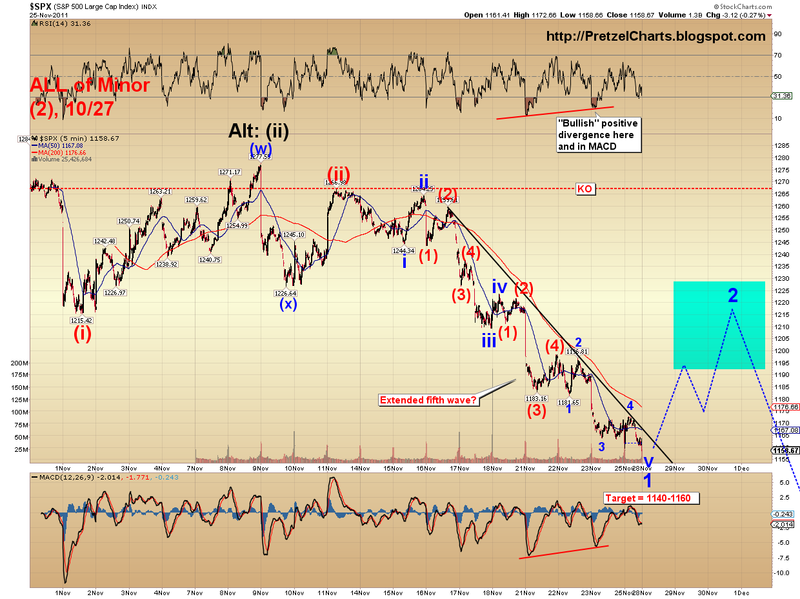 Call the SPX upside target under the (extended fifth wave count) 1209-1225. I expect a reversal from there and new lows afterwards. More detail in the update later. Hmm. By counts on some markets, the rally may have ended today. Interesting, as an amateur, I have been trying to count the waves on the Forex Aud and Euro, I was fine until about two hours ago then I got hopelessly lost. On the Aud, I was considering the move upward from 9863 and in the Euro from 1.3285 as a series of consecutive (or nested) 3 wave consolidation but I think that it is extending too far. Furthermore, I am not sure how an alternative count would look like. I am excited to see your post. I absolutely love your work Jason, keep it up! Intra-day, the S&P 500 almost perfectly hit at your first projected peak. If you allow for the move to the 1184 low to correspond (loosely) with your following projected regional low, we may already be halfway up the second peak. Perhaps the projection was mostly spot on, but the time-frame is more condensed than what you have here? This scenario would fit in well with the likely disappointing Italian bond auction tomorrow, so it's something to think about. Still think the rally ended today? Been away for a couple of hours and just saw the futures. Up since you made your comment. I'm still trying to figure out why....on gods green earth....we rallied today. I'll post it tomorrow and throw it out to the crowd, but did you see the call (sell or buy...hmmmm) activity in mic..i..dees? whoa, that's a chunk o change! Hey I think I got it figured out. don't often see 3/4 million contracts on them.....somebody thinks your waterfall is at the very least after Jan exp. Or, perhaps confirmation!!!! that's my vote! Hi Narfu187, thanks and welcome! Yes, as you'll see in the update I just posted, my inclination is that the rally will end tomorrow. Has the SPX gone high enough to KO the alt bounce scenario? NM, missed the KO line at 1267ish. Hard to see on a phone. Michael, you're also on the wrong thread. :) This is the old one.